I do hope that you have all had a fantastic Easter break: eaten loads of chocolate and spent some quality time with your family and friends. Of course this half-term's highlight is SATS week. I have e-mailed various resources to support your children's progress, so please use those as much as you see fit. Please continue to make sure that your P.E kit is in school at all times as once again we will not have a set date. During the study of Easter the children will learn about why Thomas doubted the Resurrection of Christ and explore possible answers. They will also discuss reasons as to why people today still belie e that Christ is alive. Furthermore, they will know that some New Testament stories that about his eternal life and identify symbols from the Baptismal and funeral liturgy that speak about eternal life. Pentecost - Continuing on into summer two, for this section of R.E, the children will learn the two stories from the New Testament about the coming of the Holy Spirit. Furthermore, through their study of the Sacrament of Confirmation they will learn about the gifts and fruits of the Holy Spirit and how they are important in the lives of Christians. For the next half-term the children's topic will be ID. This is a really exciting topic, which will be complemented by our class novel Stormbreaker. ID will be the nucleus for all subjects and the children can look forward to exploring DNA,, as well as taking each other's finger prints. As always, if you do have any concerns at all then please do not hesitate to speak to me. I understand that with SATS coming up, it can be stressful time of the year for everybody and it is my priority that all of the children and their families feel supported in the up-coming weeks. I hope that you have all had an amazing half-term and come back refreshed and ready to go! Please continue to make sure that your P.E kit is in school at all times as once again we will not have a set time for P.E. For the first week back the children will be continuing their focus on prayers. During the study of Lent the children will learn about the church's customs. They will understand the reasons why Jesus spoke of prayer, fasting and almsgiving being important and be able to think about how they could apply these teachings to their own lives. The children will be discussing poverty in the world today and think about what we can do as a school to help reduce it. Finally they will understand how the church celebrates this in the Sacrament of Reconciliation. The virtue and value for this half-term is Learned and Wise. The children will be finding god in all things and wise in the ways they use their learning for the common good. For the first week back we will be continuing with Hola Mexico. However, from the second week onward, we will be beginning our new topic of Frozen Kingdom. This is a really exciting topic and covers a wide spectrum of: art, history, geography, science and of course writing. The children will absolutely love exploring the different areas of this topic. I would like to take this opportunity to wish you all a very happy new year and may your wishes all come true. I do hope that you have all had an amazing Christmas holiday and are ready to engage in some really fun and exciting learning opportunities. Please make sure that your P.E kit is in school at all times, as for this half-term and going forward, our P.E will not be on a set afternoon. During this unit the children will become familiar with the main features of the story of Christmas and recognise the main similarities and differences in the two accounts. Conjointly, from their study of the prologue of St. John they will understand that Christ enjoyed a special relationship with God the Father and they will be able to think about how he revealed God's presence in the world. Year 6 will continue their weekly preparation for Confirmation by taking in weekly lessons with Mrs. Vandenberg, which will be on a Thursday afternoon. The virtue and value for this half-term is eloquent and truthful.The children will be truthful in what they say in themselves, the relations between people and the rest of the world and eloquent in the way in which they portray it. Our new topic for this half-term is Hola Mexico, as you may have guessed Hola Mexico centers around the country of Mexico. During this topic the children will have the opportunity: to taste Mexican Cuisine, create their own festival masks and explore the great history and culture of Mexico. This is a really colourful and vibrant topic, which all of the class will enjoy. 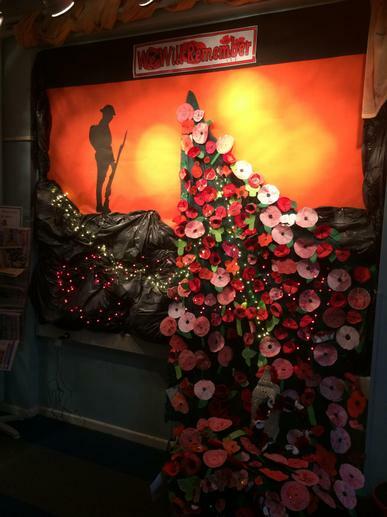 On Friday Year 6 led our annual Act of Remembrance. The children read beautifully. 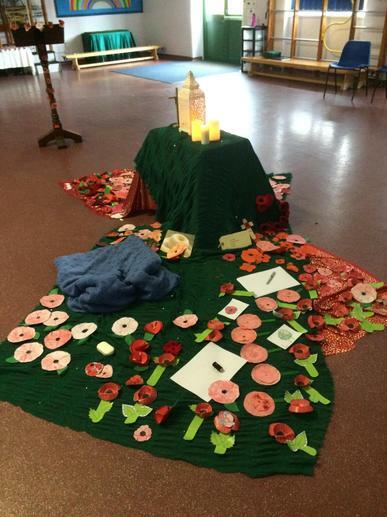 To end our Remembrance Liturgy each child in school laid a poppy in our waterfall of poppies. 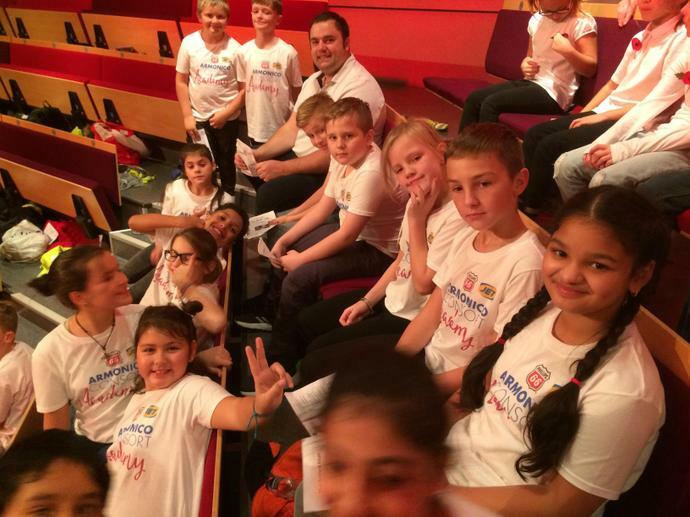 Finally, Year 6 participated in a special concert at Warwick Arts Theatre on Friday evening. 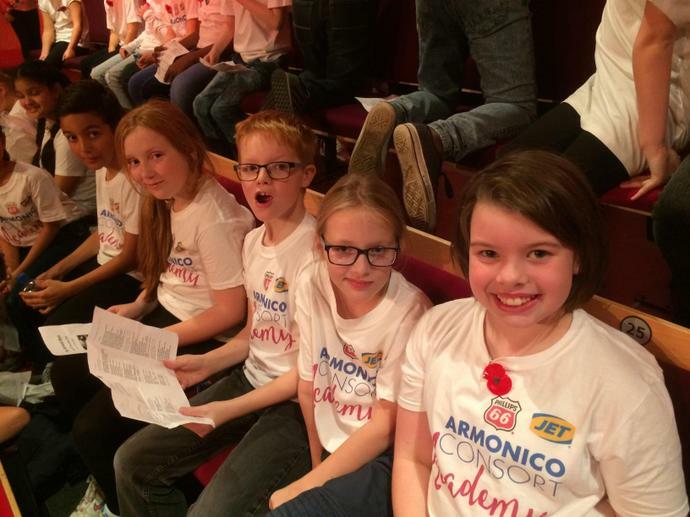 They were amongst 10 schools who sang with Armonico Consort in a very special performance of The Armed Man. 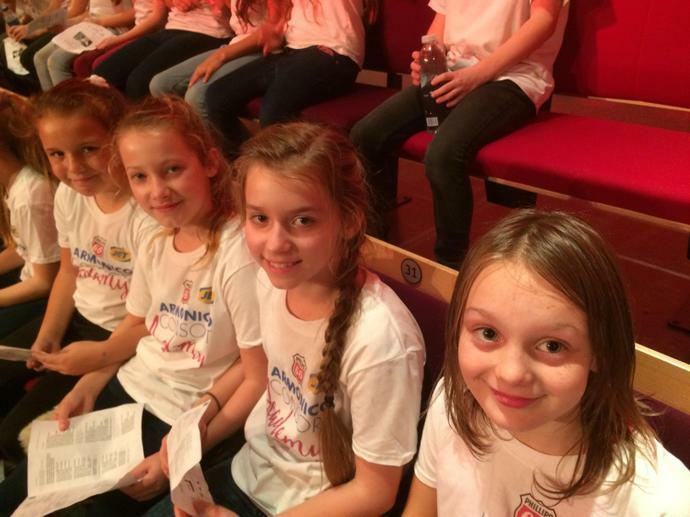 The concert required them to sing in Latin, French and English. Year 6 you were amazing! Mrs. Armstrong and I hope that you have all had a lovely break. We weclome you back to what has to be one of the nicest and exciting times of the academic year; the build up to Christmas - it is a really enjoyable time to teach and hopefully you all come back fresh eager to learn. 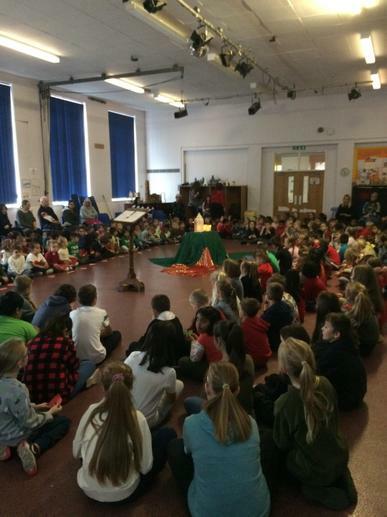 In this unit of work the children will consider the call of the disciples by Jesus. They will learn about the demands that the call of Christ placed on these first disciples. Conjointly they will think about ways in which people (including themselves), answer the call of Christ today through the life of the Church. This half-term's virtue and value is faith-filled and hopeful. We will be looking at how we put faith in God and how we can be hopful for our future. The children will also be analysing the concept of 'faith,' and answering this important question, what does it mean to have faith in somebody? This half-term our topic is Fallen Fields. This topic is very much a history based topic and it will form the nucelus for all subjects. Fallen fields offers the children the chance to reflect and remember all people affected by warfare. However, 2018 is a special year as it is the 100th year anniversary of the end of World War 1. To begin our topic the children will explore the local town and examine the war monuments which we have, will they see any familar names? 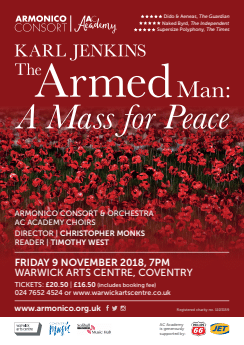 Furthermore, I am very proud and excited to say that on the 9th of November the year 6 class have been invited to participate in The Armed Man: A Mass for Peace. 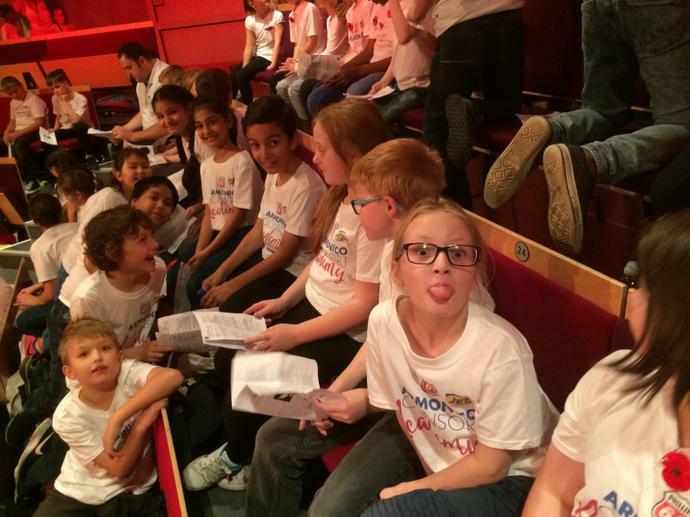 This will be a fantastic experience for all the children involved. Mr. J. Davies and Mrs W. Armstrong. I hope you all had an excellent Summer. Mrs Armstrong and I can’t wait to hear all about it! As a class we will be preparing for making our confirmations in February by undertaking a schedule of work that will ensure that all children who are making their confirmation are completely ready for this Sacrament, this will be lead by Mrs. Vandenberg. The story of the people of God. During this unit the children will be given the opportunity to develop their knowledge and understanding of the structure of the Bible and the forms of literature that are found in the different books. The children will be introduced to stories of the significant people in the Old Testament. They will discover what some of these stories tell us about their relationship with God. 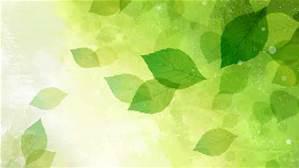 This first half-term's values and virtues are: Compassionate and Loving. We are learning to be: Compassionate towards others, near and far, especially the less fortunate; and loving by our just actions and forgiving words. This half-term our topic is Darwin's Delights. This topic is very much a science based topic, however as with all cornerstones topics it will form the nucleus for all subjects. To kick off our topic the children will be going on a field trip to the Habitat Trust. This will give the children the opportunity to explore various animals first hand and record notes - just like Charles Darwin did 200 years ago. 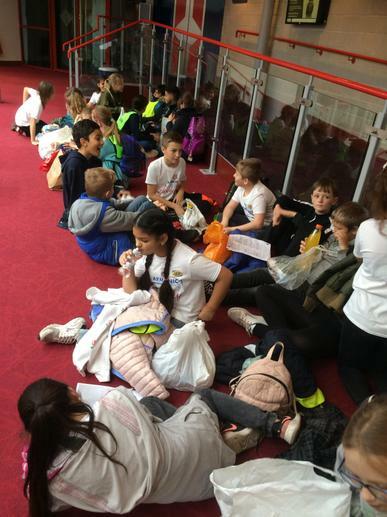 Year 6 will be taught by Mrs Barnett every Monday afternoon – Mrs Barnett will be teaching topic in the form of extended writing tasks and practical activities. This half term Art lessons will fall mainly on a Friday. If you have an old t-shirt (it doesn’t have to be yours, maybe ask parents/guardians for an old one of theirs so it covers more of your uniform!) please bring one of these in as soon as possible. Please make sure you bring in a water bottle that you can take home each day, wash out and bring back – drinking water is really important! Pencil cases are not required in the classroom - everybody will have their own pen, pencil, ruler, rubber, sharpener, highlighter etc. These are neatly packed away in a pencil pot on each table to save space, but please feel free to bring your pencil case to school and keep it in your bag ready for wet play times, lunch times or golden time! Your child will receive a list of Home Learning Projects from which they can choose 4 to complete throughout the half term. These will be displayed on our ‘Home Learning’ board just outside the classroom. As in previous years St Patrick’s will be providing your child with Homework books again this year. 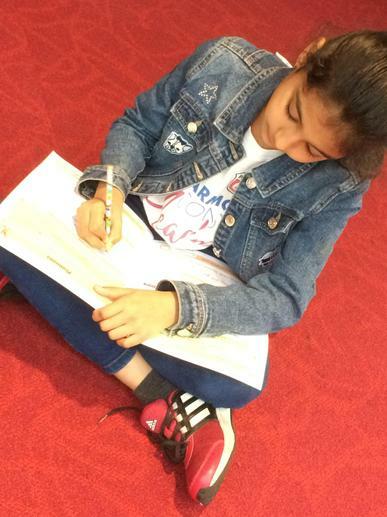 Year 6 homework is set up slightly differently to other year groups. (additional homework maybe set to enhance your children's learning). This year we will be continuing the reading challenge! We encourage children to read every evening, but we know this can be tricky sometimes. Reading at home can happen in the car on the journey home, during time set aside at home to read with your child or they can even read to themselves. PLEASE make sure you comment in their reading record to evidence the fact that they have read at home. Children who read (and have evidence of this in reading records) a minimum of 3 times a week throughout the whole school year will receive a very special reading award: The award for each year group is slightly different - so that means there are 7 to collect in total... I wondered if any children in Reception can collect all 7 by the time they leave in Year 6? Please regularly check our class page for the latest information, photos of our learning and helpful documents for adults and yourselves.